Lisson Gallery looks forward to exhibiting at Paramount Studios for the very first edition of Frieze Los Angeles. The gallery will show a focused presentation of works by Cory Arcangel, Daniel Buren, Hugh Hayden, Carmen Herrera, Channa Horwitz, Anish Kapoor, Pedro Reyes, Leon Polk Smith, Sean Scully and Stanley Whitney, among others. The gallery’s presentation at Frieze Los Angeles coincides with the recent announcement of the North American representation of Irish-American artist, Sean Scully. Landline Magenta (2018) balances horizontal bands in thick gestural brushstrokes, typical of the unique style Scully has developed over the past five decades. The acclaimed Landline series was recently shown at the Smithsonian’s Hirshhorn Museum in Washington, D.C.. Scully’s work synthesises a thoroughly international collection of influences and personal perspectives – ranging from the legacy of American abstraction, with inspiration from the likes of Mark Rothko to that of European tradition, with nods to Henri Matisse and Piet Mondrian. Lisson Gallery looks forward to presenting an exhibition of works by Sean Scully across both spaces in New York, on view from 30 April to 8 June 2019. A highlight of the booth is Hugh Hayden’s Crown of Thorns (red/oak) (2019), a meditation on the institutional and internalised trauma of modern football. The work is a continuation of Hayden’s practice of anthropomorphising domestic objects and engaging them as a visceral lens for exploring the human condition. 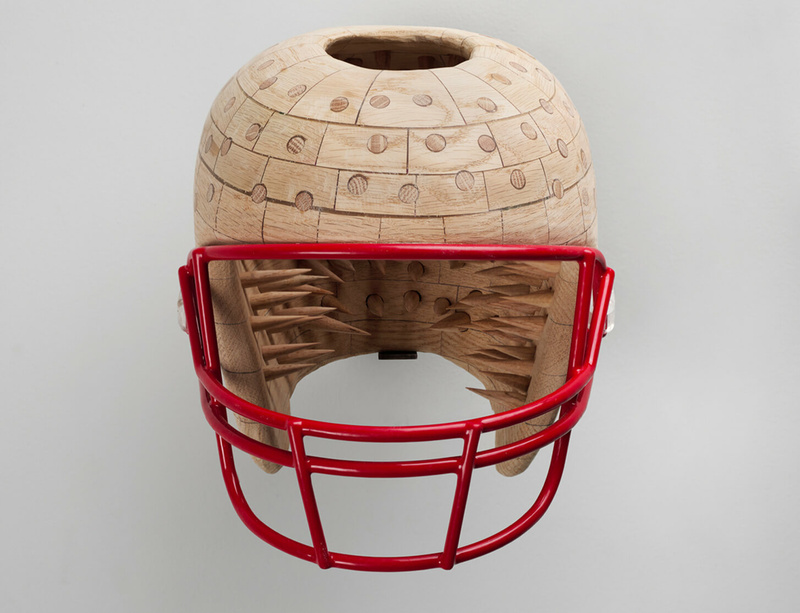 Crown of Thorns (red/oak) (2019) references the sacrifice and trauma induced by young people who are seduced by success in professional sport, particularly in the artist’s home state of Texas. The internal thorns allude to the inevitable physical and emotional damage from which the hard exterior is intended to protect, while the title is a Biblical reference to the sacrifice of mind and body. Cory Arcangel’s new work from his ‘Scanner’ painting series, Fila, will feature prominently on the booth. This series of works – scanned textiles, featuring recognizable brands or logos – are printed using commercial sign inks onto IKEA LINNMON tables. Alongside this, offsite Arcangel has created a specially constructed installation that will be a facsimile version of Arcangel Surfware's Norwegian flagship store, installed at Dover Street Market in downtown Los Angeles. The pop-up will open on Saturday 16 February with a reception from 3-5pm, and run through 6 March 2019. A further highlight to the booth will be Leon Polk Smith’s Constellation: Black Arrow (1972), a large canvas presenting a trio of vibrantly coloured painted shapes defined by a precise but irregular contour. Considered one of the founders of the hard-edge style of Minimalism. Leon Polk Smith (1906 – 1996) rose to prominence in the late 1950s and early 1960s with his distinctive shaped canvas series — the Correspondences. By 1967, Smith's circular explorations introduce additional panels and define his shaped, multi-part Constellation series of paintings and drawings, among his most exuberant and inventive compositions. Channa Horwitz’s Square Moiré Sampler (in two sections) from 1985 will also be on view. Horwitz, who was born and raised in Los Angeles, helped to lead a feminist movement centred around inclusion with fellow women artists in the 1970s. Her pioneering visual philosophy has influenced generations of sound, music, movement, dance, light and animation artists around the world. The Lisson Gallery booth will also feature significant works including Carmen Herrera’s Kyoto (Green), (1966/2016) a distinctive wall piece from her Estructuras series; Anish Kapoor’s Mirror (Cobalt Blue to Mipa Blue no.5) (2018); and Pedro Reyes’s Totem (Kisosen) (2017) carved from volcanic stone. Further accompanying the selection will be a new oil painting by Stanley Whitney, created especially for the fair, and Daniel Buren’s Pile Up: High relief n°B12 (2018), a three-dimensional space composed of two types of aluminium rectangular blocs: one covered with paint and the other treated in order to have a reflective, mirror-like surface. For more information on Frieze Los Angeles and to plan your visit click here.